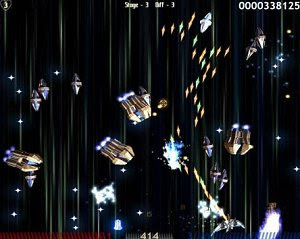 Pteroglider is a fun and innovative incarnation of the classic arcade space shooter genre. It is aimed at players who enjoy dynamic and challenging games, that are easy and fun to play, yet require a fair dose of skill to master. Contrary to most other arcade space shooter games, Pteroglider does not limit your angle of fire to a straight vertical line. It enables you instead to target your enemies using the mouse. Until now destroying your enemies, while not absorbing damage has been a matter of luck - With Pteroglider it's all a matter of skill. Pteroglider features a simple yet extremely handy save game system that stores the name of your profile, game progress and score along with personal settings such as mouse sensitivity and sound/music volume level. Each time you start a new game session with any of your profiles, you can choose to start from any difficulty level and stage, provided you have previously achieved it. Apart from that, with a single mouse click you can send your scores to the online ranking, to match yourself against players from around the globe. This feature requires no registration - in case when your profile name is already used by someone, the server will automatically assign a unique id number to your Profile Name so that you can easily recognize which entry is yours! Pteroglider features four themed stages: Nebula, Bio, Warp and Ion Strom. Each of them has a different horde of enemies that use distinct strategies and shoots as well as a massive and deadly end stage boss. We tried to make the stages as different and contrasting as possible, so each one has a different dynamic, multi-layered background and an experience boosting original music soundtrack that suits the look and feel of the stage. Every time you pass all four stages of Pteroglider you gain access to a higher difficulty level, so that you can test yourself against enemies that inflict more damage and implement more aggressive strategies. If the game gets too difficult though, you can always go back to previous levels and collect more upgrade boosters or simply have a more relaxing gameplay. What's more, the groups of enemies attack in a random order, so no game is exactly the same! Whatch out, some of the combinations are deadly!